Colors:BlackBrownNavyWhiteGrayBeigeSturdy and comfortable on the waist this belt goes great with jeans and other casual outfits. Made from quality fabrics complement your unique style with a simple but elegant belt that will be sure to make your friends family and co-workers envious. 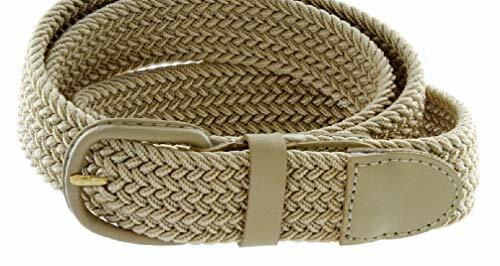 Soft Elastic Fabric interwoven to stretch and to allow air cooling Solid Metal Buckle Gold Finish secured by leather inlay and stitches. Belt Approx: 32mm or 1-1/4" Wide - Buckle Approx: 1-5/8" x 1-5/8"
Solid Metal Buckle, Gold Finish, secured by leather inlay and stitches. If you have any questions about this product by HIFORU CLOTH, contact us by completing and submitting the form below. If you are looking for a specif part number, please include it with your message.